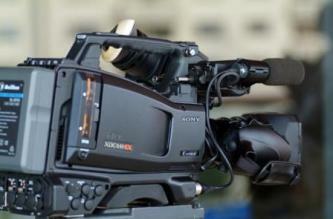 Sony continues to expand and improve its XDCAM EX lineup with the PMW-350K Full HD Camcorder. Boasting three 2/3"-type full-HD CMOS sensors, solid state SxS workflow and an impressive set of advanced features, this professional shoulder-mount camera sets a new standard for affordable, high-end videography. 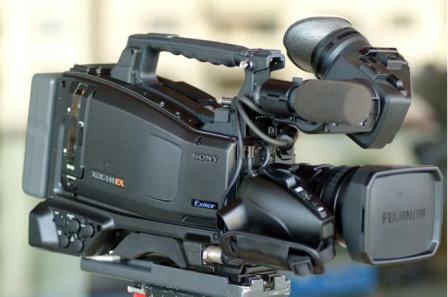 With a chassis based on the XDCAM HD422, the PMW-350K also manages to be one of the lightest--and most well-balanced--camcorders in its class (even factoring in the interchangeable 16x Fujinon lens built specifically for this camera). But comfort and portability are only the beginning. Pressing the Record button reveals what the PMW-350K is really about: topnotch image quality. And this camcorder comes by it honestly, whether in its High Quality 35Mbs HD setting or using the optional 25Mbs DVCAM recording mode. Either way, your images are captured quietly and efficiently to SxS PRO or the new, lower-cost SxS-1 memory cards--storing up to 280 minutes of MPEG-2 HD video on two 32GB cards. If needed, you can even record uncompressed 4:2:2 video by capturing to an external recorder via the camera's HD-SDI output. Exceptionally low power consumption (only 15W) means the PMW-350K can run on a single 90Wh battery for up to 5 hours--not only good for the environment, but fewer batteries mean less weight (and lower costs) on long-distance shoots. Other features--some passed down from Sony's higher-end F900R and PDW-700--are also worth mentioning, including scene file settings, adjustable gamma, and Matrix settings that can be stored on memory cards. Four channels of audio and a viewfinder that incorporates the EX1/EX3's entire high-resolution LCD screen (and adds image flip, to boot) make the shooter's job even easier. With the introduction of the PMW-350K, Sony reaffirms its XDCAM EX cameras as serious high-definition contenders. The PMW-350K is equipped with three newly developed 2/3"-type Exmor CMOS sensors, each with an effective pixel count of 1920 (H) x 1080 (V). These deliver superior picture performance with full-HD resolution. This 2/3"-type image sensor allows the camcorder to provide an excellent sensitivity of F12 in 60Hz mode (F13 in 50Hz), a remarkable signal-to-noise ratio of 59dB, and a high horizontal resolution of 1000 TV lines (in 1920 x 1080/59.94i mode). In addition, the large sensors can capture images with a shallower depth of field, giving users more freedom of creative expression. What's more, the Exmor CMOS sensor's unique design deploys an A/D converter to each column of pixels, resulting in a much lower clock speed than conventional CMOS sensors. This makes it possible to greatly reduce power consumption of the camcorder and extend battery life. The PMW-350K records 1920 x 1080 full HD images using the "MPEG-2 Long GOP" codec, which conforms to the MPEG-2 MP@HL compression standard. "MPEG-2 Long GOP" is a mature codec--also adopted by the XDCAM HD and HDV 1080i series of products--which enables users to record stunning HD video and audio with highly efficient, reliable data compression. The PMW-350K offers a choice of bit rates--either 35Mbs (HQ mode) or 25Mbs (SP mode)--depending on the desired picture quality and recording time. The HQ mode supports 1920 x 1080, 1440 x 1080 and 1280 x 720 resolutions. The 1440 x 1080 mode is new to the PMW-350K, ensuring native integration of XDCAM EX footage into an XDCAM HD Professional Disc workflow. By supporting 1440 x 1080, 35Mbs recording, material can be utilized with no transcode, just a rewrap to MXF for NLE and archiving. Affordability: SxS-1 media (introduced in late 2009) provides users with a lower cost alternative to SxS PRO media that offers the same high performance, but with an estimated 5-year life span when recording at full capacity once per day. Users can check the card life on their PMW-350K camcorder and even see an alarm when the data rewriting limit is reached. The adoption of three 2/3" imagers and standard 2/3" bayonet lens interface means the PMW-350K is compatible with a wide variety of broadcast standard optional lenses, as well as being supplied with a 16x (optical) zoom HD lens. 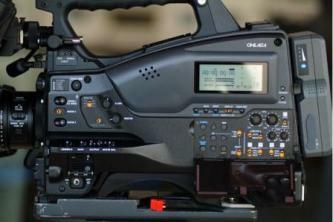 The PMW-350K provides a uniquely flexible control system designed to appeal to both broadcasters and videographers. The supplied Fujinon lens for the PMW-350K adopts a unique focus ring mechanism, which offers two types of manual focus, plus an auto focus operation. The lens is equipped with two independent focus wheel mechanisms, which can be switched by sliding the focus ring itself back and forth. Utilizing a mature and highly efficient compression format together with high performance SxS memory cards, the PMW-350K can record superb quality HD images for an exceptional 140 minutes* on a single 32GB SxS card. As the PMW-350K features two memory card slots, this recording time is easily increased to 280 minutes (with two 32GB cards) and when recording across two cards, the transition is seamless without any frame loss. This feature makes the PMW-350K an ideal camcorder for a wide variety of content production applications, including wedding and event videography, that require a long recording time. Although the PMW-350K is equipped with a shotgun microphone, three optional microphones--the ECM-680S, ECM-678, and ECM-673--are also available. As well as the supplied microphone, the ECM-680S can operate in either stereo or monaural (uni-directional) mode. These modes can be selected from the switch on the microphone or from the PMW-350K itself. By virtue of recording on flash memory cards, the PMW-350K can start recording virtually the instant the camcorder is turned on. Moreover, the PMW-350K system automatically records on an empty area of the card--there's no danger of overwriting existing content. 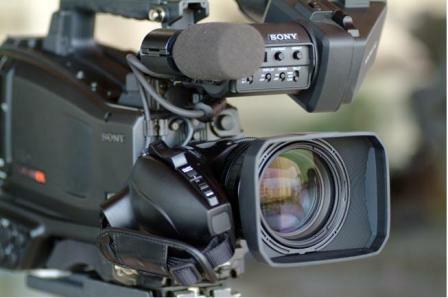 Each time a recording is started and stopped on the PMW-350K camcorder, the video and audio signals are recorded as one clip. During playback, users can cue-up to the next or previous clip simply by pressing the 'Next' or 'Previous' button, as you would do on a CD or DVD player. In addition to its unique focus ring, the PMW-350K's supplied lens is equipped with independent rings for zoom and iris adjustment. These are located adjacent to the focus ring, in the same layout as is common on shoulder-type camcorders. This gives users a high level of operational comfort and control. The AF (Auto Focus) Assist function enables operators to manually change focus positions using the focus ring during AF mode. This means that AF reference focus positions can be shifted to manually changed positions. The MF (Manual Focus) Assist function helps to precisely focus on the target subject when shooting in MF mode. When the MF Assist is turned on, auto focus is momentarily activated and finely focuses on the subject closest to the focal point of the lens at that time. This feature decreases any chromatic aberration caused by the lens, which is active only with the PMW-350K's supplied lens and with certain third-party lenses that incorporate compensation data. Please check with your lens supplier for ALAC support. The PMW-350K comes equipped with optical ND (Neutral Density) filters and electrical CC (Color Correction) filters. The optical ND filters are controlled via a built-in ND filter wheel--Clear, 1/4ND, 1/16ND, and 1/64ND. And with the electrical CC filters, users can easily obtain the desired color temperature by setting the mode--3200K/4300K/5600K/6300K--on a camcorder-assignable switch. Users can select the four values cyclically, or choose one preset value. This is also available via an assignable switch. This is useful when a sudden change occurs during shooting, and a quick and direct setting is required. The PMW-350K offers a powerful Slow & Quick Motion function--commonly known as 'over-cranking' and 'under-cranking' in film shooting--that enables users to create unique 'looks' or special effects with slow- and fast-motion images. The PMW-350K can capture images at frame rates selectable from 1 fps (frame per second) to 60 fps in 720P mode and from 1 fps to 30 fps in 1080P mode, in increments of 1 fps. For example, when viewed at 23.98P, images captured at 60 fps will appear 2.5 times slower than normal. Conversely, images captured at 4 fps will appear six times faster than normal. The PMW-350K offers a Slow Shutter function for capturing clear images in low-light environments. This allows the shutter speed to be extended to a maximum of 64 frames. The Slow Shutter function not only increases camera sensitivity but also produces a special blurring effect when shooting a moving object, for enhanced shooting creativity. The shutter speed is selectable from 2-, 3-, 4-, 5-, 6-, 7-, 8-, 16-, 32-, and 64-frame periods. The PMW-350K camcorder offers a wide variety of gamma curves to flexibly handle contrast and give a specific 'look' to an image. 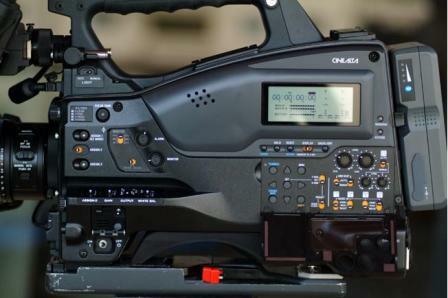 In addition to six types of standard gamma curves, there are four types of Hyper Gamma which are identical to those on high-end CineAlta camcorders. Operators can select the best-suited preset gamma curve, depending on scenes. The PMW-350K offers an Interval Recording function that records signals at predetermined intervals. This is convenient for shooting over long periods of time, and also when creating pictures with special effects of extremely quick motion. Frame Recording is a special feature of the PMW-350K camcorder that is especially useful for stop-motion/clay animation shooting. Using this function, images for predetermined frames are recorded every time the Record button is pressed. In addition to the electronic shutter speed controls, the PMW-350K also has a "shutter angle" control--which is familiar to film users. By setting the shutter speed to "angle," the PMW-350K automatically operates with the proper exposure time, determined by the selected frame rate and the shutter angle. The Scene File feature of the PMW-350K allows camera operators to easily call up customized picture-tonal settings--such as the parameters of matrix, color correction, detail, gamma, and knee--to suit particular shooting conditions, rather than having to readjust the camera each time. This gives users greater operational efficiency. SxS memory cards can be used for storing and loading scene files. The Turbo Gain function can boost the camera gain up to +42 dB, which helps reproduce images in very low-light environments. The PMW-350K is equipped with a large, easy-to-view, color LCD with a high resolution of 1920 x 480 pixels, which simplifies focusing. The viewfinder can also be used to instantly review recorded footage, as well as access the camera's set-up menus, view thumbnails, and display status indications. The ATW (Auto Tracing White Balance) function of the PMW-350K automatically adjusts the camera's color temperature according to changes in lighting conditions. This function is useful when recording outside for long periods, as lighting changes gradually over time. The PMW-350K also has an ATW Hold function, which allows the operator to hold auto tracing at a desired color balance via an assignable switch. The PMW-350K comes equipped with a wide range of interfaces optimized for a variety of operational needs. These include an HD-SDI output, downconverted SD-SDI output, i.LINK (HDV 1080i and DVCAM stream) input/output, USB2 and analog composite output. Timecode In/Out and Genlock in are also supported. An HDMI output (Type A) allows the user to show the picture on a consumer display or professional monitor equipped with an HDMI input. Noncompressed video and two channels of audio can be output. When HDMI output is selected, other outputs are not available. For future expandability, the PMW-350K has a 50-pin interface option (available Autumn 2010), which offers a Digital Extender function to digitally double images in size. Unlike lens extenders, the Digital Extender function performs this doubling without any loss of image sensitivity, often referred to as the F-drop phenomenon. The HDCA-702 MPEG TS adapter, which can be directly docked onto the PMW-350K, transmits an MPEG Transport Stream (TS) of MPEG via a DVB-ASI output. This can be done simultaneously as the PMW-350K records onto SxS memory card. This function is also available using the 50-pin interface option (which will be available in Autumn 2010). A Sony 8-pin remote interface is supplied with the PMW-350K. Various camera settings can be remotely controlled using an optional RM-B150 RM-B750, RCP-750, RCP-751, RCP-920, or RCP-921 Remote Control Unit via its 8-pin remote connector (please note that not all controls on the remote control units are supported by the PMW-350K). Composite output is always available for monitoring purposes, regardless of HD/SD output selection.